We are thrilled to announce that WXXI in Rochester, New York, is now running our full hour show! We’ll be in Rochester next month for the latest installment of the Political Junkie Roadshow with Neal Conan. But now people in Rochester can listen to the show each week and decide whether or not they want to show up in September. And so, in honor of WXXI’s courageous and bold decision, we have a Rochester-related trivia question in this week’s podcast: who was the last U.S. Senator from New York who hailed from Rochester? Send your answer to [email protected], or submit in the box below. We’ll pick a winner at random from the bunch. 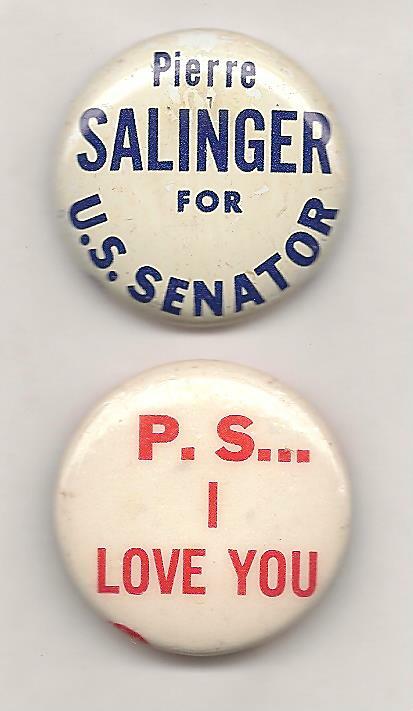 The winner will get a fabulous, vintage Political Junkie button, their name on the next podcast and bragging rights for all eternity. Last week’s trivia question was: who was the last White House press secretary who, sometime in his career, ran for office? The answer is Pierre Salinger. 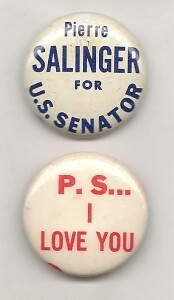 Salinger was Press Secretary under John F. Kennedy and, briefly, Lyndon Johnson. He had already won the Democratic 1964 primary for the Senate in California when the retiring incumbent, Clare Engle, died. Governor Pat Brown appointed Salinger to the seat, but he lost in November to Republican song and dance man George Murphy. It was a rare pickup for the GOP in a year when the party was swamped by the Goldwater defeat. This week’s winner is Stuart Vance of Kapa’a, Hawaii. Stuart wins the coveted Political Junkie button. And Tuesday was Stuart’s birthday! Happy birthday, and enjoy the button.